Easy DIY peel and stick tile concept of mosaic sticker smart tile is made of an adhesive substrate topped with a gel component called epoxy resin, the embossed 3d epoxy resin offers stunning visual impact. the tiles are thin and light, they can be installed in minutes over a clean and sleek surface without any mess or specialized tools, and never crack with time.Bathroom backsplash wall tile is also an economic wall covering material, if you are getting tiled of the same design, just peel them off and change a new style. 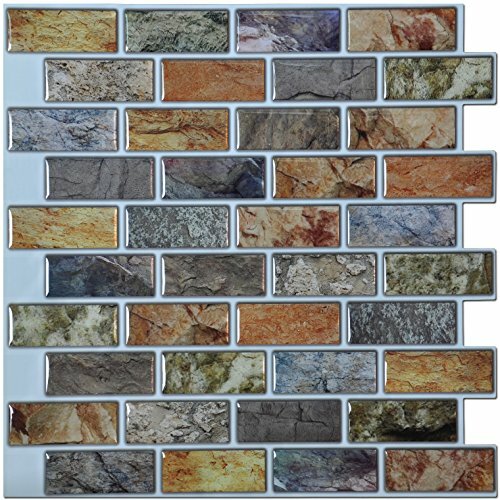 Art3dTM mosaic sticker offers veracious collections to meet you different taste.Bathroom backsplash wall tiles are lightweight, easy to handle, cut and maintain, they will remain on your walls for as long as you wish them to be. The tiles can also be easily installed directly over existing panels or smooth surface. Especially designed for kitchen backsplashes and bathroom backsplashes, the tiles are resistant to the heat of stovetops and the humidity of bathrooms (do not use in shower). If you have any questions about this product by Art3d, contact us by completing and submitting the form below. If you are looking for a specif part number, please include it with your message.